Ross Island, Ross Dependency; claimed by New Zealand. Albert P. Crary Science and Engineering Center (aeronomy and astrophysics, biology and medicine, geology and geophysics, glaciology and glacial geology, and ocean and climate systems). The station takes its name from it's geographic location on McMurdo Sound. The sound was named after Lieutenant Archibald McMurdo of HMS Terror. Under the command of British explorer James Clark Ross, the Terror first charted the area in 1841. Later, British explorer Robert Falcon Scott established a base camp close to this spot in 1902 and built a cabin there that was named Discovery Hut. It still stands as a historic monument near the waters edge on Hut Point at McMurdo Station. The volcanic rock of the site is the southernmost bare ground accessible by ship in the world. The United States officially opened its first station at McMurdo on February 16, 1956. 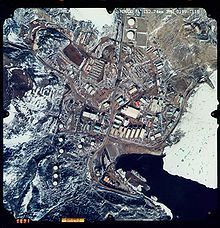 The base was built by the U.S.Navy Seabees and was initially designiated Naval Air Facility McMurdo. On November 28, 1957, Admiral George J. Dufek was visited McMurdo with a U.S. congressional delegation for a change of command ceremony. McMurdo became the center of scientific and logistical operation during the International Geophysical Year, an international scientific effort that lasted from July 1, 1957, to December 31, 1958. The Antarctic Treaty, now signed by over forty-five governments, regulates intergovernmental relations with respect to Antarctica and governs the conduct of daily life at McMurdo for United States Antarctic Program (USAP) participants. The Antarctic Treaty and related agreements, collectively called the Antarctic Treaty System (ATS), was opened for signature on December 1, 1959, and officially entered into force on June 23, 1961. The first scientific diving protocols were established before 1960 and the first diving operations were documented in November 1961. The supply ship MV American Tern during cargo operations at McMurdo Station during Operation Deep Freeze 2007. The square building in the foreground is Discovery Hut. On March 3, 1962, the U.S.Navy activated the PM-3A nuclear power plant at the station. The unit was prefabricated in modules to facilitate transport and assembly. Engineers designed the components to weigh no more than 30,000 pounds (14,000 kg) each and to measure no more than 8 feet 8 inches (2.64 m) by 8 feet 8 inches (2.64 m) by 30 feet (9.1 m). A single core no larger than an oil drum served as the heart of the nuclear reactor. These size and weight restrictions were intended to allow the reactor to be delivered in an LC-130 Hercules aircraft. However, the components were actually delivered by ship. The reactor generated 1.8 MW of electrical power and reportedly replaced the need for 1,500 US gallons (5,700 l) of oil daily. Engineers applied the reactor's power, for instance, in producing steam for the salt water distillation plant. As a result of continuing safety issues (hairline cracks in the reactor and water leaks), the U.S. Army Nuclear Power Program decommissioned the plant in 1972., After the nuclear power station was no longer operational, conventional diesel generators were used. There were a number of 500 kilowatts (670 hp) diesel generators in a central powerhouse providing electric power. A conventionally fueled water desalination plant provided fresh water. McMurdo Station in November 2003. Today, McMurdo Station is Antarctica's largest community and a functional, modern-day science station, which includes a harbor, three airfields (two seasonal), a heliport and more than 100 buildings, including the Albert P. Crary Science and Engineering Center. The station is also home to the continent's two ATMs, both provided by Wells Fargo Bank. The primary focus of the work done at McMurdo Station is science, but most of the residents (approximately 1,000 in the summer and around 250 in the winter) are not scientists, but station personnel who are there to provide support for operations, logistics, information technology, construction, and maintenance. Scientists and other personnel at McMurdo are participants in the USAP, which co-ordinates research and operational support in the region. Werner Herzog's 2007 documentary Encounters at the End of the World reports on the life and culture of McMurdo Station from the point of view of residents. And Anthony Powell's 2013 documentary Antarctica: A Year on Ice provides time-lapse photography of Antarctica intertwined with personal accounts from residents of McMurdo Station and adjacent Scott Base over the course of a year. An annual sealift by cargo ships as part of Operation Deep Freeze delivers 8 million U.S. gallons (6.6 million imperial gallons/42 million liters) of fuel and 11 million pounds (5 million kg) of supplies and equipment for McMurdo residents. The ships are operated by the U.S. Military Sealift Command but are manned by civilian mariners. Cargo may range from mail, construction materials, trucks, tractors, dry and frozen food, to scientific instruments. U.S. Coast Guard icebreakers break a ship channel through ice-clogged McMurdo Sound in order for supply ships to reach Winter Quarters Bay at McMurdo. 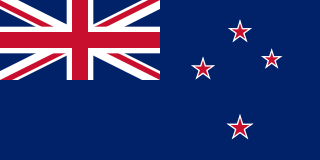 Additional supplies and personnel are flown in to nearby Williams Field from Christchurch, New Zealand. Between 1962 and 1963, 28 Arcas sounding rockets were launched from McMurdo Station. 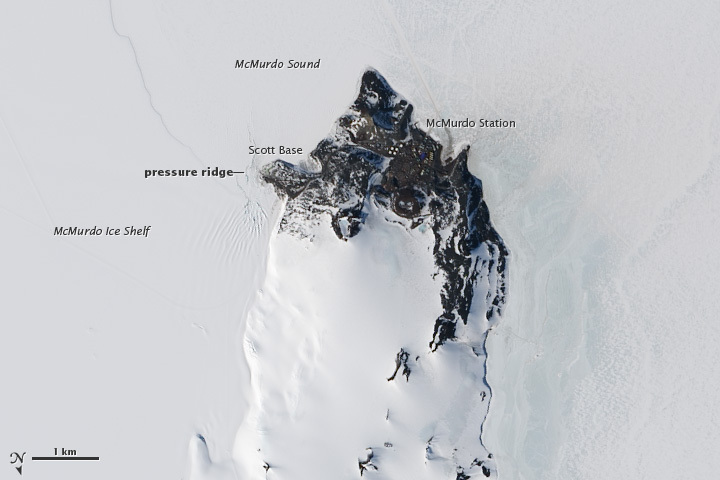 McMurdo Station is about two miles (3 km) from Scott Base, the New Zealand science station, and the entire island is within a sector claimed by New Zealand. Recently there has been criticism leveled at the base regarding its construction projects, particularly the McMurdo-(Amundsen-Scott) South Pole highway. McMurdo has attempted to improve environmental management and waste removal over the past decade in order to adhere to the Protocol on Environmental Protection to the Antarctic Treaty, which was signed October 4, 1991, and entered into force January 14, 1998. This agreement prevents development and provides for the protection of the Antarctic environment through five specific annexes on marine pollution, fauna and flora, environmental impact assessments, waste management, and protected areas. It prohibits all activities relating to mineral resources except scientific. A new waste treatment facility, which greatly exceeds the requirements of the treaty, was built at McMurdo in 2003. Three Enercon E-33 (330 kW each) wind turbines were deployed in 2009 to power McMurdo and New Zealand's Scott Base, reducing diesel consumption by 11% or 463,000 litres per year. McMurdo (nicknamed "Mac-Town" by its residents) continues to operate as the hub for American activities on the Antarctic continent. McMurdo Station briefly gained global notice when an anti-war protest was held on February 15, 2003. During the rally, about 50 scientists and station personnel gathered to protest the coming invasion of Iraq by the United States. McMurdo Station was the only Antarctic location to hold such a rally. Scientific diving operations continue with 10,859 dives having been conducted under the ice from 1989 to 2006. A hyperbaric chamber is available for support of polar diving operations. With all months having an average temperature below freezing, McMurdo features a polar ice cap climate (Köppen EF). However, in the warmest months (December and January) the monthly average high temperature may occasionally rise above freezing. 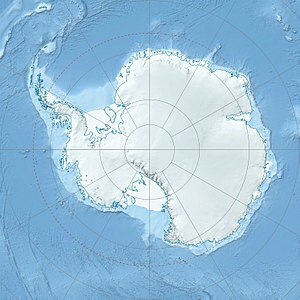 The place is protected from cold waves from the interior of Antarctica by the Transantarctic Mountains, so temperatures below −40° are rare, compared to more exposed places like Neumayer Station, which usually gets those temperatures a few times every year, often as early as May, and sometimes even as early as April, and very rarely above 0 °C. The highest temperature ever recorded at McMurdo was 10.8°C on December 21, 1987. For a time, McMurdo had Antarctica's only television station, AFAN-TV, running vintage programs provided by the military. The station's equipment was susceptible to "electronic burping" from the diesel generators that provide electricity in the outpost. The station was profiled in a 1974 article in TV Guide magazine. Now, McMurdo receives three channels of the US Military's American Forces Network, the Australia Network, and New Zealand news broadcasts. Television broadcasts are received by satellite at Black Island, and transmitted 25 miles (40 km) by digital microwave to McMurdo. Also, for a time McMurdo also played host to one of the only two shortwave broadcast stations in Antarctica. The station—AFAN McMurdo—transmitted with a power of 1 kilowatt on the shortwave frequency of 6,012 kHz and became a target for shortwave radio listening hobbyists around the world because of its rarity. The station continued broadcasting on shortwave into the 1980s when it dropped shortwave while continuing FM transmission. McMurdo Station receives both Internet and voice communications by satellite communications via the Optus D1 satellite and relayed to Sydney, Australia. A satellite dish at Black Island provides 20 Mbit/s Internet connectivity and voice communications. Voice communications are tied into the United States Antarctic Program headquarters in Centennial, Colorado, providing inbound and outbound calls to McMurdo from the US. Voice communications within station are conducted via VHF radio. 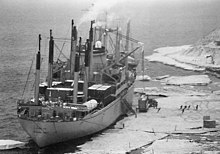 This 1983 image of USNS Southern Cross at McMurdo Station shows cargo operations on a floating ice pier. Such piers have been in use since 1973. 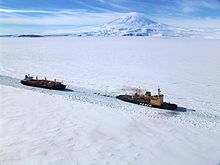 MV American Tern being led by the Russian icebreaker Krasin to McMurdo Station during Operation Deep Freeze 2006. Mount Erebus is visible in the background. McMurdo has the world's most southerly harbor. A multitude of on- and off-road vehicles transport people and cargo around the station area, including Ivan the Terra Bus. There is a road from McMurdo to the South Pole, the South Pole Traverse. The Richard E. Byrd Historic Monument was erected at McMurdo in 1965. It comprises a bronze bust on black marble, 150 cm × 60 cm (5 ft × 2 ft) square, on a wooden platform, bearing inscriptions describing the polar exploration achievements of Richard E. Byrd. It has been designated a Historic Site or Monument (HSM 54), following a proposal by the United States to the Antarctic Treaty Consultative Meeting. The bronze Nuclear Power Plant Plaque is about 45 cm × 60 cm (18 in × 24 in) in size, and is secured to a large vertical rock halfway up the west side of Observation Hill, at the former site of the PM-3A nuclear power reactor at McMurdo Station. The inscription details the achievements of Antarctica's first nuclear power plant. It has been designated a Historic Site or Monument (HSM 85), following a proposal by the United States to the Antarctic Treaty Consultative Meeting. ^ a b "McMurdo Station". Giosciences: Polar Programs. National Science Foundation. Retrieved July 11, 2016. ^ "4.0 Antarctica - Past and Present". www.nsf.gov. ^ a b "US Antarctic Base Has Busy Day". Spartanburg Herald-Journal. November 29, 1957. Retrieved July 7, 2010. ^ a b Pollock, Neal W (2007). "Scientific diving in Antarctica: history and current practice". Diving and Hyperbaric Medicine. 37: 204–11. Retrieved June 8, 2013. ^ Rejcek, Peter (June 25, 2010). "Powerful reminder: Plaque dedicated to former McMurdo nuclear plant marks significant moment in Antarctic history". The Antarctic Sun. Retrieved June 16, 2012. ^ Priestly, Rebecca (January 7, 2012). "The wind turbines of Scott Base". The New Zealand Listener. Retrieved June 16, 2012. ^ Clarke, Peter McFerrin (1966). On the ice. Burdette. ^ Miguel Llanos (January 25, 2007). "Reflections from time on 'the Ice'". MSNBC. Retrieved January 11, 2008. ^ "McMurdo Station". Astronautix.com. Archived from the original on October 6, 2012. Retrieved August 13, 2012. ^ Moss, Stephen (January 24, 2003). "No, not a ski resort – it's the south pole". The Guardian. London. Retrieved May 12, 2010. ^ "Ross Island Wind Energy". Antarcticanz.govt.nz. Retrieved September 28, 2015. ^ "New Zealand Wind Energy Association". Windenergy.org.nz. Archived from the original on November 17, 2013. Retrieved November 6, 2013. ^ "Protest photos". PunchDown. Retrieved August 29, 2010. ^ "Klimatafel von McMurdo (USA) / Antarktis" (PDF). Baseline climate means (1961–1990) from stations all over the world (in German). Deutscher Wetterdienst. Retrieved April 6, 2017. ^ "McMurdo Sound Climate Normals 1961−1990". National Oceanic and Atmospheric Administration. Retrieved February 19, 2014. ^ "Station McMurdo" (in French). Meteo Climat. Retrieved April 6, 2017. ^ Berg, Jerome S. Broadcasting on the Short Waves, 1945 to Today. p. 213 – via Google Books. ^ a b "List of Historic Sites and Monuments approved by the ATCM (2012)" (PDF). Antarctic Treaty Secretariat. 2012. Retrieved January 3, 2014. ^ "Ross Island DGC". DGCourseReview. Retrieved September 3, 2013. "Facts About the United States Antarctic Research Program". Division of Polar Programs, National Science Foundation; July 1982. 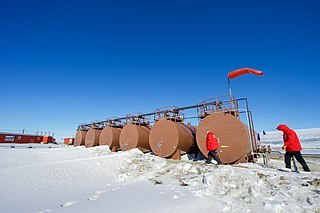 Wikimedia Commons has media related to McMurdo Station. "McMurdo Station". Geographic Names Information System. United States Geological Survey. Cape Hallett is a snow-free area on the northern tip of the Hallett Peninsula on the Ross Sea coast of Victoria Land, East Antarctica. Cape Adare lies 100 km (62 mi) to the north. Winter Quarters Bay is a small cove of McMurdo Sound, Antarctica, located 2,200 miles (3,500 km) due south of New Zealand at 77°50'S. The harbor is the southern-most port in the Southern Ocean and features a floating ice pier for summer cargo operations. The bay is approximately 250m wide and long, with a maximum depth of 33m. The name Winter Quarters Bay refers to Robert Falcon Scott's National Antarctic Discovery Expedition (1901–04) which wintered at the site for two seasons. Lois M. Jones was an American geochemist who led the first all-woman science team to Antarctica in 1969. They were also the first women to reach the South Pole. Jones was well regarded for her contribution to geological research in the McMurdo Dry Valleys, one of the few ice-free areas of Antarctica, and published many papers and abstracts.